This afternoon I attended yet another SL Blogger's party, this one being hosted by Nika Dreamscape at media baron Stuart Warf's Rezzed TV Island. By the way, if you haven't been to Rezzed TV Island, you should drop in for a visit, it's a wonderful build. Unlike past parties, there was no specific theme. Usually there's a theme like Mardi Gras or Steampunk and everyone dresses up to match. But this one was wide open and everyone came in great, yet unsynchronized outfits. For me, I simply showed off my chest with a high-quality open green shirt. Nika and Stuart hosted this event, which is always held by a volunteer blogger. Will you be the next host? Several events took place during party, including an exhibition house XWA Wrestling card, and a fishing tournament. Of course, those ubiquitous breeding bunnies were on sale, too. Quite a few bloggers were in attendance, although many of the old-time bloggers did not show up this time. Lalo Telling and Snickers Snook dance together here. The infamous parody Tweeter SecondLie made an appearance, here with Crap Mariner. I wonder who's under there? Time for an up-bag shot? The lovely Tymmerie Thorne is in charge of events for the Blogger's group, and she's been doing a wonderful job organizing things. Since she's been on the case, we've had very regular meetups, and they're fun, too. UberFashionista Callie Cline showed up, but for some reason wore a "Happy New Year" hat. Had a late night, Callie? NWN events reporter Chestnut Rau made an appearance. Why not, it's a big event! SuperBuilder Anhalya Lycia somehow snuck into the event! There were at least 40 others in attendance, far too many to mention. Please come to the next event! Some weeks ago I attempted to improve the in-store experience for my customers by reducing the number of visible textures. 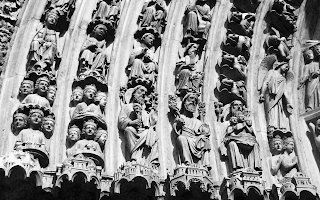 The theory was this: visitors appear at the teleport landing point, but their viewers are instantly overloaded by texture loads and their world is gray. You see, my store’s design concept is an open one that makes all items very easy to find because it’s mostly open to view. The open concept worked at first, because I perceived an issue I had when shopping: some shops have far too many rooms, hallways and areas in which to look for items. It makes shopping nearly impossible for those in a rush, although some may find difficult shopping experiences fun. I wanted to avoid that situation, especially where customers don’t even see your products because they were in a room the customer never encountered. So I simply laid out all my items in easy to view locations. My first store had no ceiling and very few walls. However, as the store grew and more products were added, the requirement for more textures (mainly on product boxes) continued to grow. It came to a point where a visitor would be faced with loading (albeit automatically) over 150 textures in order to see the store. Tracking software indicated some visitors would appear and then quickly leave. The obvious conclusion was that they were overwhelmed by the gray view and simply went somewhere else without shopping. Not good! The experimental solution was to block off each of the store’s areas from general view, requiring shoppers to enter them before they could see the products and require texture loads. This way the store would become visible much faster and this should be a better experience for shoppers. I even placed helpful signs and arrows indicating where people should enter each area. After weeks of running in this mode, I now conclude the texture load theory was wrong. While the store did come into view much faster when teleporting in, sales dropped off significantly. At first I took this to indicate a continuation of the degraded economy in general, but several friends (Amber, Haley and Marlee) suggested the visibly blocked store sections conveyed a different impression to shoppers - hidden products must be creepy! Since shopping is a very psychological matter, especially in SL, I thought there’s probably something to this theory. Ten days ago I took down the obscuring walls to once again reveal the entire store to view. As expected, long texture load is now quite evident when teleporting in, but what would happen to sales? After ten days of “open” operation, I can safely say that sales are up significantly! The conclusion? While texture rezzing performance is always important, the psychological factors that develop from the store’s visual appearance trump performance when it comes to shopping. There’s a very disruptive change coming from the Real World and it’s going to hit Second Life later this year. That’s my conclusion after thinking about the implications of the new SL Viewer 2.0 beta that’s been making its way into computers around the SL world for the past couple of weeks. Pieces of the master-plan jigsaw puzzle are coming together and The Lab’s strategy is now becoming much clearer. Let me explain. 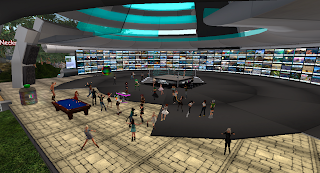 Viewer 2.0 is part of a larger strategy for vastly expanding the scope of Second Life. We’ve heard their execs fancifully describe a future where they might have a million simultaneous residents, an unimaginably large number compared to today’s mere 80,000. As unbelievable as that number is, I think they’re not kidding. To achieve this, they must have: even more compelling content to attract and retain more residents; the ability to hold more simultaneous residents per region; many more new residents; and a great first-hour experience to keep them once they arrive. Viewer 2.0 addresses several of these points, but not all of them. While much has been written about the features of the new viewer for good or evil, there are two things that stand out above all the rest in my mind. First: Shared Media and Second: Mesh import. Yes, Mesh import has not yet been released, but The Lab has indicated they’ll be releasing it “later this year”. It’s my belief that these two features will change the landscape so utterly there will be a New Virtual Order. Shared Media, if you haven’t heard, is the ability to bring web content directly into the Grid. At first glance this might appear to mean you can view your spreadsheet or powerpoint presentation in world. Perhaps you’ll watch a YouTube video. Yeah, that’s likely quite useful for some, but many residents question what value it could possibly do for them. Who needs spreadsheets, anyway? My belief is that viewing plain old web pages, videos and documents are not the best use of this feature. Instead we’ll see a complete revolution in the control systems for in-world items. Gone will be those bush-league blue dialog boxes that make operating many virtual items terribly frustrating: makers must fit their system into only twelve identically ugly buttons, and this makes almost every complex item confusing to use. Instead we will soon see the development of very professional control systems that are as beautiful and functional as you’d see on contemporary web pages - because they WILL BE web pages! And you can do this all from within LSL scripts. It's not about viewing YouTube on a prim - it's about using the maker’s easy-to-use web-like controls on a prim. We’ll also see a flood of data entering and leaving the Grid via these new web interfaces, providing unimaginable capabilities. 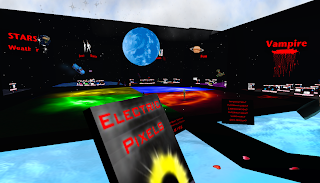 One simple very example: an in-world game with a terrific interface that you can also play outside the grid via the website - using the exact same interface! The applications that could be made are almost limitless. Let’s face it, the previous development environment was extremely primitive and it severely limited what creators could build. Many doors open with Shared Media, and The Lab is no doubt hoping for significant innovation. Mesh Import is the ability to load existing 3D designs from the outside into the Grid, without having to tediously build things in-world with the rudimentary 3D tools provided. Sure, lots of amazing things have been built using them, but consider this: there are immensely powerful 3D modeling tools outside the Grid, used by tens of thousands of professional modelers to produce perhaps millions of incredibly detailed 3D models. These models, with a bit of tweaking, will soon be rapidly flowing into the Grid, and their quality will probably trump existing content. When word of the ability to convert these models into dollars gets out, I expect to see many new content developers arriving with vast libraries of amazing items. There will be a great fog of skepticism throughout The Grid over whether these new features are good things. Many will say they have no use for them and question why they are being introduced when many other issues could be addressed instead. But I think they are necessary, even if we don’t know precisely what we’ll do with them. I think this because these are very powerful tools, and in the history of mankind powerful tools are always picked up by creative people to produce wonderful things. In the 1920’s skeptics said talking movies would be the end of film, and many asked why bother with sound at all? Were they right? The introduction of voice and many other innovations to film eventually made it possible for James Cameron to produce Avatar, an experience beyond the conception of a 1920’s filmgoer. 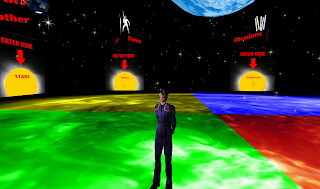 Second Life must also innovate to take us to amazing place we can’t yet imagine. What does this mean for existing makers? Generally it’s not good, because if you’re not a 3D model mesh importer or a web coder, you might have a hard time keeping up with amazing products made with the new techniques. Gadget makers in particular may be forced to convert their products to the new web interfaces simply to keep up with the competition - and that’s at best. At worst their products may simply become irrelevant if they are replaced by direct web content. Since most existing content makers are part-timers who might not have the time or training to make the transition, I’m expecting a large turnover in the maker population. I anticipate two more developments: something to significantly increase server scalability and a broad advertising strategy to attract a very large number of new residents - and perhaps advertising specifically designed to attract new makers. We’ll see this advertising appear once all the elements of SL 2.0 are in place. They’ll all arrive on the Grid using Viewer 2.0, of course, since that’s a key part of the strategy. There will be a tidal wave of new residents and makers. The new makers will build most energetically, while carnage awaits many existing makers. But when the smoke eventually clears, we’ll see a million residents, walking through the new cathedrals of an awesome virtual reality.